Posters like this one were used to encourage people to become members of the American Red Cross (ARC). 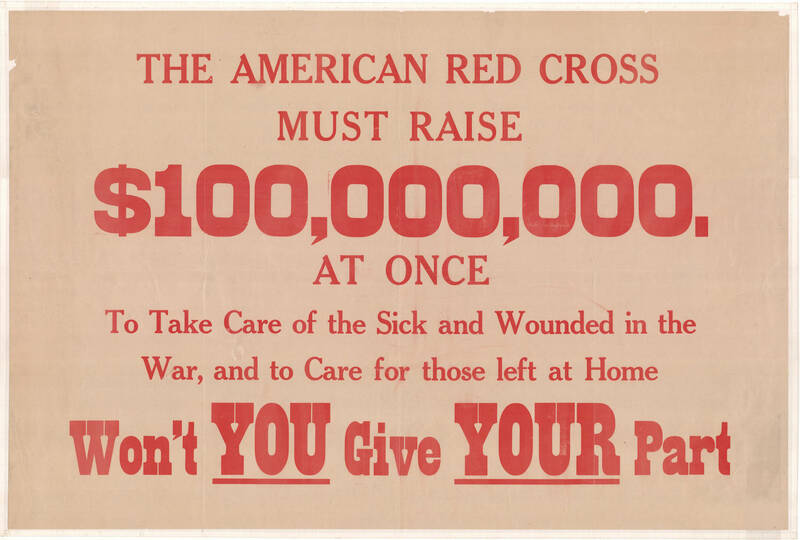 This poster was distributed as part of a major fundraising campaign organized by the War Council of the American Red Cross and its chair Henry P. Davison with the goal of raising 100 million dollars. The 100 million dollars raised by the War Council was used to support the war effort in Europe, mainly France and England. An ARC commission of eighteen men was assigned to manage the use of funds in Europe. This commission quickly decided that the American Red Cross should manage all other American charity organizations or services working in Europe. Some organizations resisted this effort, but the ARC War Council ran a very successful fundraising campaign, with the help of posters like this one that describes charitable giving as a citizen’s duty in wartime. Smaller charities and organizations realized that if they wanted funds from the ARC, they needed to work with the ARC and relinquish some control of their operations. “The American Red Cross Must Raise $100,000,000,” Digital Public Library of America, https://dp.la/item/de3f23d5b7764fb8ebd57c837277b687. Courtesy of State Archives of North Carolina, North Carolina Department of Natural and Cultural Resources via North Carolina Digital Heritage Center.